And while Smola’s creativity is anything but limited, he demonstrated during his talk that an individual’s creativity is insignificant compared to a network’s. To give the audience members a sense of the ambition of the “Voice and Language in AWS” project, Smola kicked off his presentation by projecting a 16th-century diagram of the human head, with its abilities—speech, hearing, imagination—labeled in antique script. Recreating the abilities of the human brain is a massive project, and the application of these services is similarly large-scaled. Smola mentioned both the business-oriented applications—finding out what customers want, personalizing content—and ways that these services can bring people closer together and achieve greater equality. Transcribe, as Smola described it, is a “huge enabler for people with disabilities.” More than a simple automated transcription service, Transcribe’s ability to detect multiple speakers and customize vocabulary can serve as a powerful aid for the deaf community. Smola went into detail, showing how Amazon services can create a “pipeline” from audio input, through Amazon Transcribe, Amazon Comprehend, Amazon Athena, and Amazon Quicksight, to create flawless transcriptions and sophisticated workflows. Amazon Lex can personalize a conversation based on a user’s social profile, give the bot a personality, create a conversational flow based on user input, and leverage rich formatting capabilities for a more engaging experience. 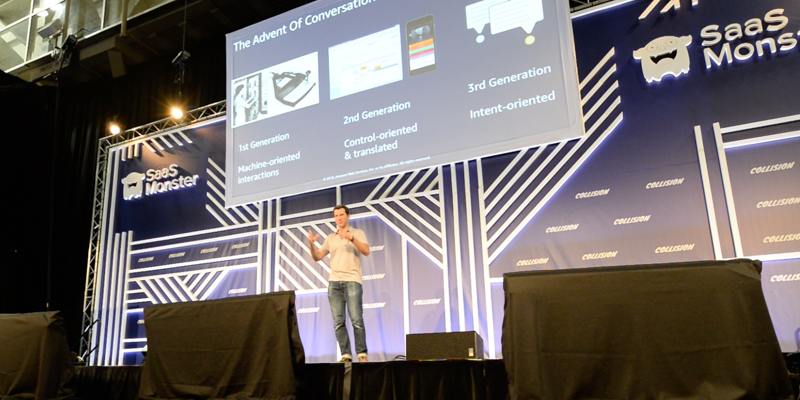 And this dynamic conversational ability has use cases across the board, from Internet of Things bots to chatbots for everyday consumer requests. We agree—Smola, as an individual, can predict many good things. But a whole network of users, harnessing their collective creativity, can create things none of us could imagine on our own.